A thesis that starts with an image. A collage by the author, titled Three Propositions. 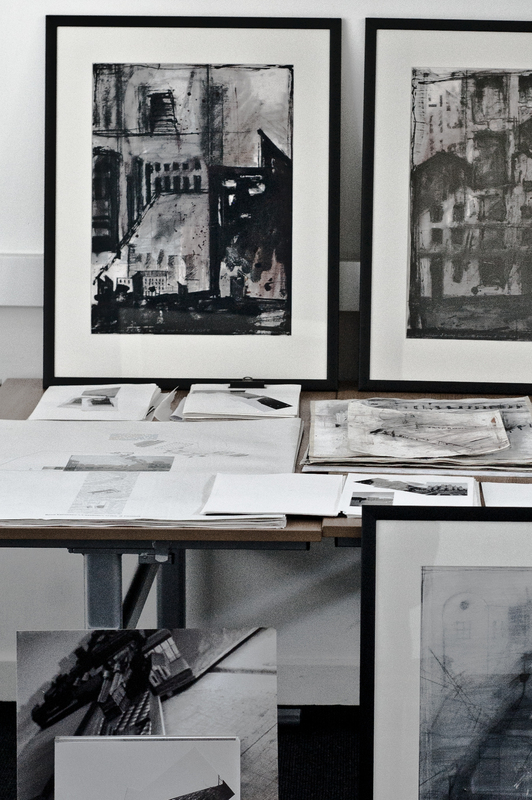 Fragments of images are cut out and pasted onto cartridge paper which has been coated with a layer of white chalk, over which marks have been made using pencil and the long side of the chalk. 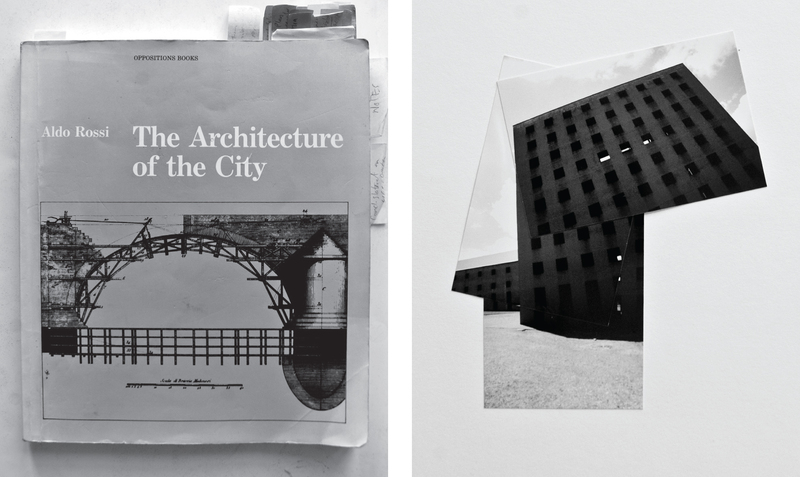 At its centre is Aldo Rossi’s Analogical City, itself a collage that uses photocopies. 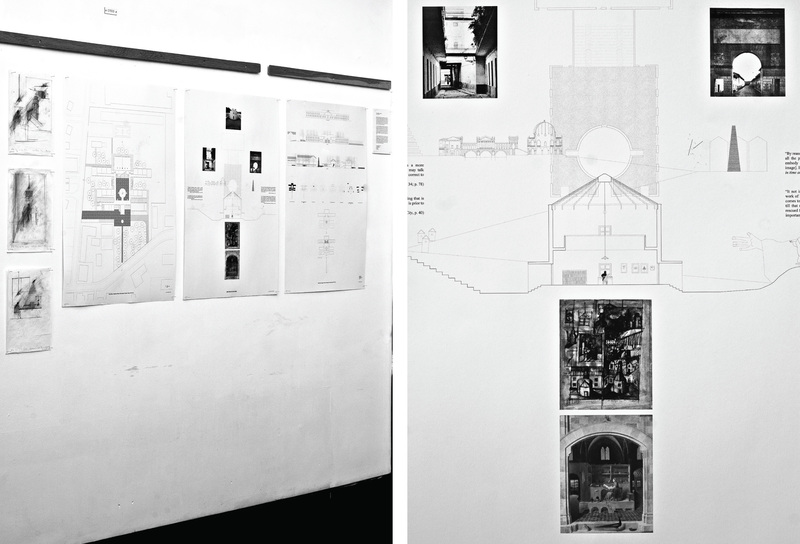 Rossi’s image is around two metres square and consists of projects by Rossi, his collaborators and his references, drawn in a mixture of projection techniques: orthographic, oblique, perspective. So we get plan, elevation, perspective, and oblique sharing the same space and with equal authority. Rossi has drawn a figure, which, in my collage is displaced vertically and overlaps onto Canaletto’s vedute painting of an alternative Venice, which Rossi used to illustrate his concept of the Analogical City. Canaletto’s painting depicts three buildings by Palladio as if they were composed in an actual cityscape. They are not. The bridge is unbuilt and the buildings either side are in Vicenza. Rossi says that an imaginary Venice is built on top of the real one. The painting is aligned with Sebastiano Serlio’s 10×10 square grid which is at the start of his Renaissance treatise in Book I On Geometry. In Book II On Perspective, Serlio illustrates the technique of perspective using the theatre sets that Vitruvius’ described in De Architettura: Tragic, Satyric, and Comical. I have cut out the one Serlio draws without the set, leaving only a gridded pattern and the outline of where the walls of the set would be, and placed it underneath the Analogical City image. On the oblique is another part of Serlio’s theatre, the semicircular seating. On top of this and aligned with the seating is a notebook extract by Rossi. To the left of the Analogical City is Jacques Lacan’s diagram of the image-screen from the chapter “What is a Picture” in The Four Fundamental Concepts of Psycho-Analysis. Following the diagram, Lacan says the screen is the “locus of mediation.” As Freud has said, memories are projected onto this screen as images, where they are superimposed on one another. Images are thus built on top of other images. Rossi says the city is the “locus of collective memory,” and I place Lacan’s diagram between Serlio’s geometric grid, and Rossi’s Analogical City. It directs the view toward another of Rossi’s notebook extracts in which he writes about collage in architecture, the construction of the city by parts, and the Analogical City as a compositional system that uses existing elements in new combinations, like the Canaletto painting. Aldo Rossi A Scientific Autobiography 1981, p. 78. Aldo Rossi, The Architecture of the City 1966, p. 40. I presented study drawings of Fagnano Olona Elementary School, Italy by Aldo Rossi and used the analysis to speculate about Rossi’s analogical praxis in the Aldo Rossi in his Study montage and accompanying sketch studies. These examine the relationship between observation, memory and imagination within an analogical framework and depict the type-forms, type-elements, monuments and anonymous architecture which are at the foundation of Rossi’s praxis. Fagnano Olona Elementary School is defined by its courtyard plan-form and axially-arranged accommodation. Within the courtyard, wide steps lead to the double height gymnasium, from which one can look toward the cylindrical library with its glazed roof. We can read this analogically and equate the gymnasium with fitness and physical health; opposite the library which is for knowledge; between these are the square and steps which is where the life of a city unfolds. The school is thus a city in microcosm. The city is where Aldo Rossi’s thesis begins. He developed a theory of types in The Architecture of the City, which was a theory for the building forms that repeated and endured most in the history of architecture and the city. Out of this evolved his concept of the Analogical City, a conceptual framework for transposing collective types and individual monuments from architectural history to be repositioned alongside the most anonymous elements of the city. Mixed, like Canaletto’s vedute and Freud’s composite dream-image. The recently established Foundation for Architecture & Education is an independent forum for the exchange of ideas about architecture and founded by Samuel Penn and Penny Lewis, who tell us, “Architects work within a rich canon. 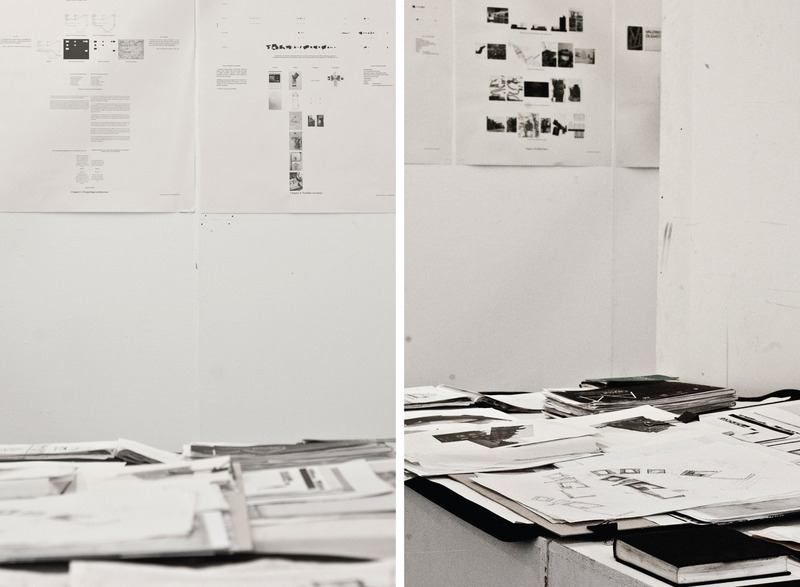 Defining the position of contemporary work in relation to the vast body of work that has gone before it is important.” The Foundation for Architecture & Education organises events, produce publications and coordinate a post-graduate course in architectural studies. The premise of which is to provide a framework in which each participant can develop their understanding of the discipline through the study of built work. 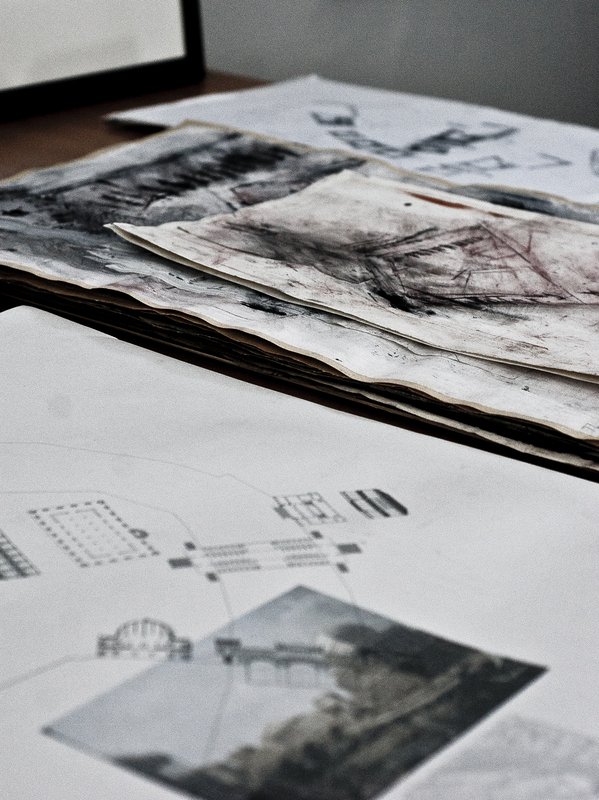 The year long course is split into three parts: Model, which involves the study of a building that exemplifies a particular idea about architecture; Axiom, which demands that participants develop a clear position on their own practice in the context of a broader appreciation of shared concerns for architecture; and Locus, which offers the opportunity to design a building in a specific location. The building chosen to study in Model provides the building type to design in Locus. Each year, a new question is asked, which will be returned to in all of the work undertaken. This year is the question of size: what size should a building be? This post is about term one Model, which concludes with an Open Review this Saturday 5th of May after a talk and presentation by architect Raphael Zuber and Christoph Gantenbein on Friday night. The building selected to study is Aldo Rossi’s school at Fagnano Olona, a small town, 40 km northwest of Milan. Designed in 1972, Rossi had built only the Segrate town square in 1965 and the Gallaratese housing block in 1970, completing the school at Fagnano Olona in 1976. Thus, it is considered one of Rossi’s early works. 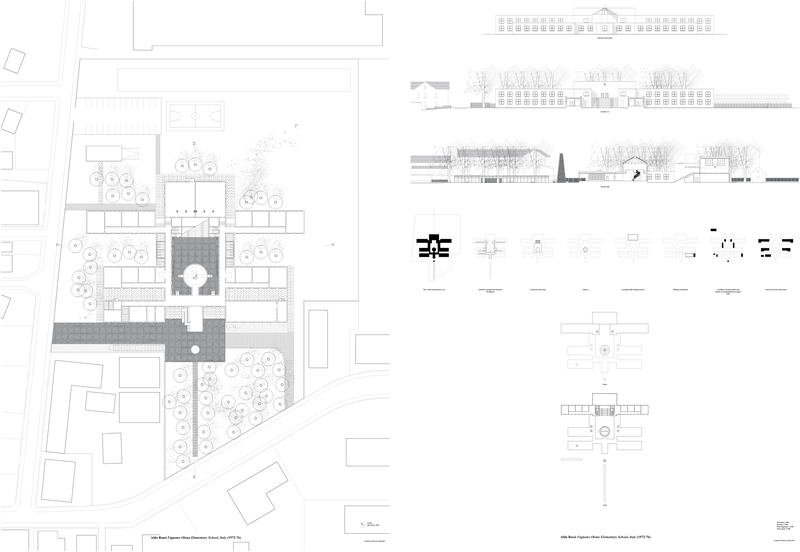 Fagnano Olona school is defined by its courtyard plan-form and axially-arranged accommodation. The elevation is punctured with large square openings set in line with the internal wall thus articulating the shadow that falls on the external surface. One enters underneath a large clock, and with the adjacent conical brick chimney (containing the plant), it is like walking into a painting by de Chirico or Sironi. When I visited (see this post), it was the Summer holiday so the school was empty and the association of de Chirico was perhaps intensified by this. The chimney marks the entrance and primary axis of the school, which is organised northeast to southwest between an assembly hall and a linear pergola. Within the courtyard, wide steps lead to the double height gymnasium on the northeast, from which one can look toward the cylindrical library with its glazed roof. Double-corridor wings surround the courtyard and contain twenty-two classrooms (over two floors), staff facilities and a dining hall. It is interesting to note a recent AR. The February 2012 issue has a short section on schools, in which Christian Kuhn offers four attributes for the building type: flexibility, clustering, common core, and connectivity. We can analyse Fagnano Olona via these attributes. Kuhn’s attribute clustering, is the division of the school into a hierarchy of smaller clusters. We can see this at Fagnano Olona in the blocks that extend outward from the central courtyard. The longer ones contain four classrooms with a corridor that is 2.5m, and repeat over two floors. The shorter ones contain three classrooms and a room off the corridor (the courtyard end), used as an informal teaching/learning space. These cluster blocks are a single storey with a 2m corridor. The blocks frame an external space with trees and grass. Flexibility is about the granularity of room sizes and not necessarily about open-plan layout. At Fagnano Olona, the classrooms are repeated units, arranged within the four linear blocks. The other two block contain staff rooms and the dining hall. There is variation in this. At the end of each block the final classroom extends to the width of the corridor. A further subtle variation exists in the northwest end classrooms because the corridor is widened to 2.5m, from the 2m width of the southeast block. Thus, there are three classroom forms, although a fourth informal one exists as the teaching/learning space, which is roughly half the size of the small classrooms and constitutes both circulation space and space for learning. At Fagnano Olona the common core is the central courtyard with steps. A playground, assembley space, town square and theatre. But also the informal teaching/learning spaces act quite readily as an indoor meeting place. The final attribute that Kuhn offers is connectivity: the school as a node in a wider network of learning. He cites other learning institutions including secondary/primary school, nursery, and library at the local level; with ICT connections at the global level. 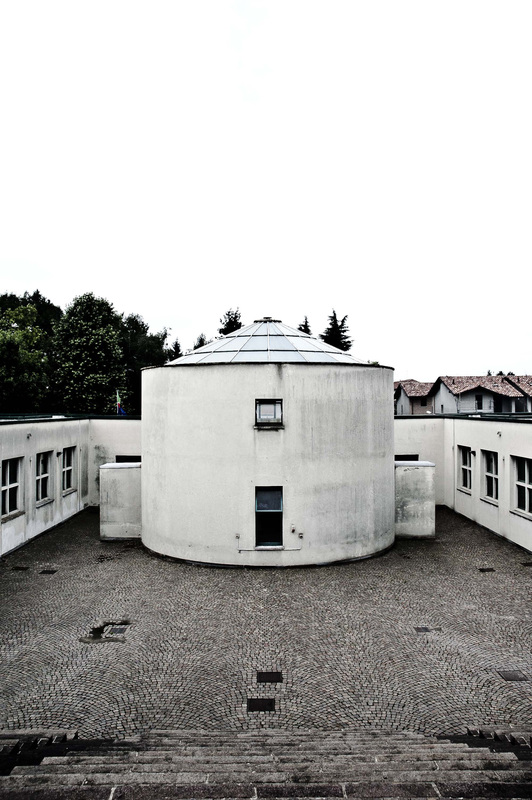 At Fagnano Olona, the school includes a library, the circular element in plan, which is also part of the courtyard and adjacent to the entrance. One imagines this space to be used by the community as, for example an exhibition space. The significance of Rossi’s work is in it’s associative links and typological investigation. Fagnano Olona is no different. A de Chirico clock and chimney mix with the pergola as a reference to the archetypal hut. The courtyard is a typological form, a town square, its steps like an amphitheatre. The library which looks like a baptistry. At Fagnano Olona my interest is in the clarity of composition and investigation of repetition and variation. Although Rossi is often attacked for dismissing human scale, studying Fagnano Olona in detail reveals the opposite. From the over-scaled square windows which contain four smaller-sized square windows within, to the subtle difference in corridor width, the modest teaching/learning spaces and in particular I was struck by the ledge at the entrance vestibule where children can sit and shelter from the rain, peering, and thinking about that strange chimney, framed by a large square window. 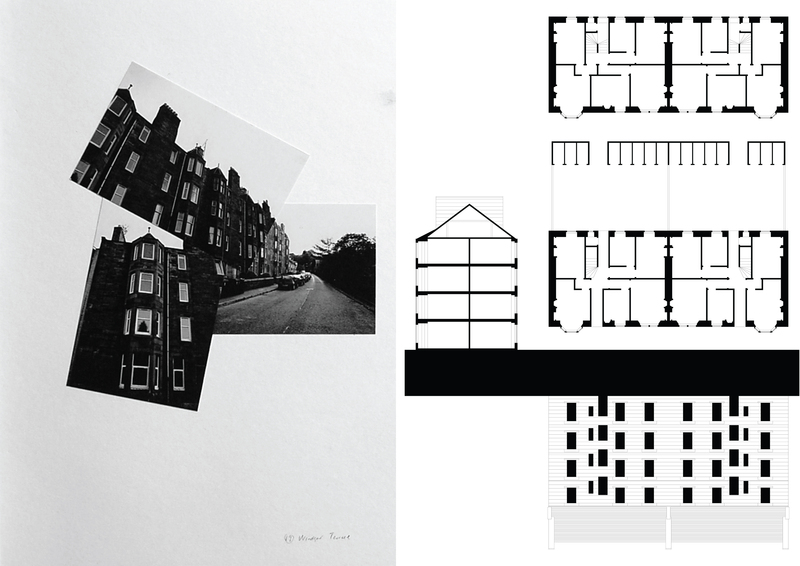 Dundee School of Architecture and Duncan of Jordanstone School of Art run a Seminar series in which one (or two) PhD Candidates present their work in progress. It runs fortnightly at lunchtime, and last week was my turn. The timing was good. I delivered a lecture to Year 3, two weeks before, which allowed me, first to consolidate my thinking on how to introduce Rossi (in broad terms); and then, Year 3 were subjected to a minor speculative foray… They may or may not have known this. The second half of that lecture was on Rossi’s Analogical City Panel from 1976. An enigmatic montage of Rossi projects, superimposed with projects of his references, condensed, into a single image. The PhD Seminar started from here and I visually de-condensed the image, speaking about Rossi’s conversation with Palladio, via Canaletto and locating some of the primary urban types. The panel was published in Lotus International number 13, where Rossi writes of the relationship between reality and imagination, or in his words, the “dialectics of the concrete.” Imagination as a concrete thing. It’s a funny type of memory, that. And back to Rossi. He concludes A Scientific Autobiography by re-drawing twelve projects. His selection dates from 1962 to 1980, and each are signed summer, “estate 1980.” These fragments exist alongside one another in the present. In my investigation of this, each of Rossi’s twelve projects are superimposed. Like in Freud’s Rome, a composite image is built. Starting with Gallaratese (1970) in Milan, then Segrate (1965), Modena (1979), Venice (1980) and others, each project is drawn, and then painted over. Drawn then painted over, and the process is repeated for each. Rossi’s twelve projects exist in a single image, superimposed. The present image partly experienced by the previous one, or two or three. The drawing sits somewhere between remembering and forgetting. A kind of mis-remembering. The drawings of Italian architect Aldo Rossi condense critical reflections on his own projects with studies of his architectural and everyday references, in a dense combination of lines and images. 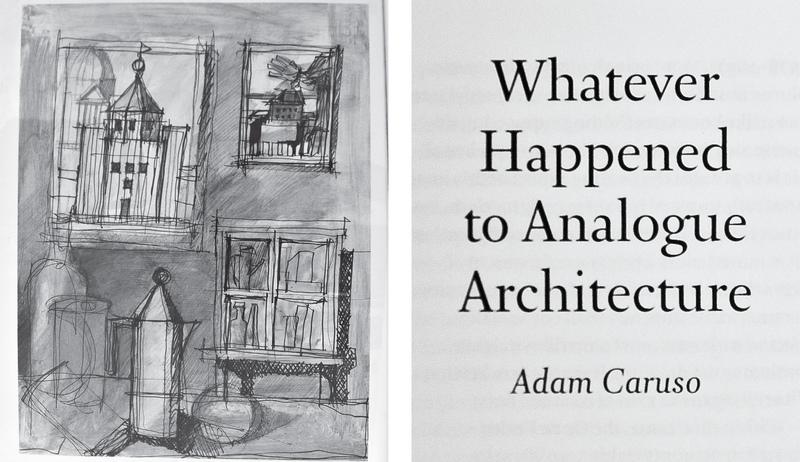 His buildings are a complex mixture of building typologies, and historical critique. Rossi’s writings are a similar hybrid of visual/textual references and reflections. 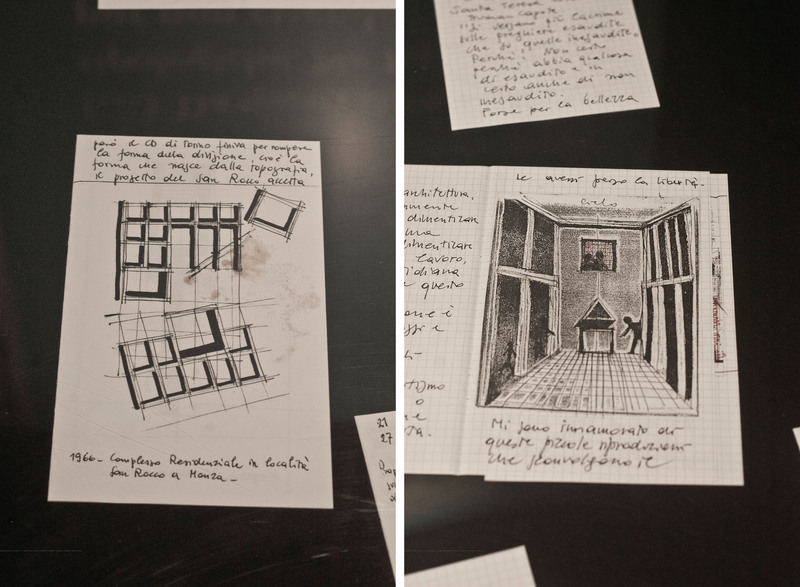 Aldo Rossi’s drawings, buildings and writings are the result of an analogical thinking process. 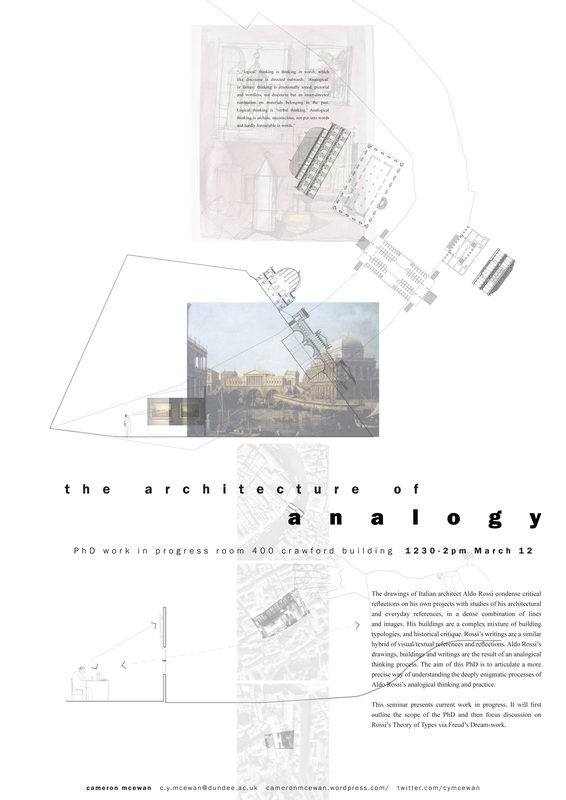 The aim of this PhD is to articulate a more precise way of understanding the deeply enigmatic processes of Aldo Rossi’s analogical thinking and practice. This seminar presents current work in progress. It will first outline the scope of the PhD and then focus discussion on Rossi’s Theory of Types via Freud’s Dream-work. In the dull lit Studio space of this November morning, I had a gruelling Supervision on the interplay between text and image in this PhD. First published by Marsilio in Padova, Italy 1966, Aldo Rossi’s The Architecture of the City celebrates its forty-fifth anniversary this year with a new 2011 Italian edition. In honour of this, the IUAV University of Venice organised an international conference and exhibition, supported by the Fondazione Aldo Rossi, the MAXXI Architettura, Rome and Casabella, the journal that Rossi first wrote for and then edited. Aiming to promote an open and wide discussion on all things Rossian, the conference first recalled the original context that generated the text; then mapped the network of translations that The Architecture of the City undertook; and finally it investigated the contemporary threads of Rossi’s legacy. Alberto Ferlenga, Director of Doctoral Studies at IUAV and author of many texts on Aldo Rossi, introduced the conference by stating that The Architecture of the City was conceived as an, “in progress synthesis of a particular time period for urban studies.” He said that the matters mentioned by Rossi are still only partly developed and waiting for further consideration by an architectural community looking for theoretical orientation. Ferlenga compared the text to one of those “unfinished works” that Rossi continuously re-worked: a sketch, a plan, a building. Many presentations emphasised the importance of Ernesto Rogers and Casabella had on Rossi. Serena Maffioletti, and others, said that the journal was the first to publish Rossi’s writings and was among the first to publish his designs. 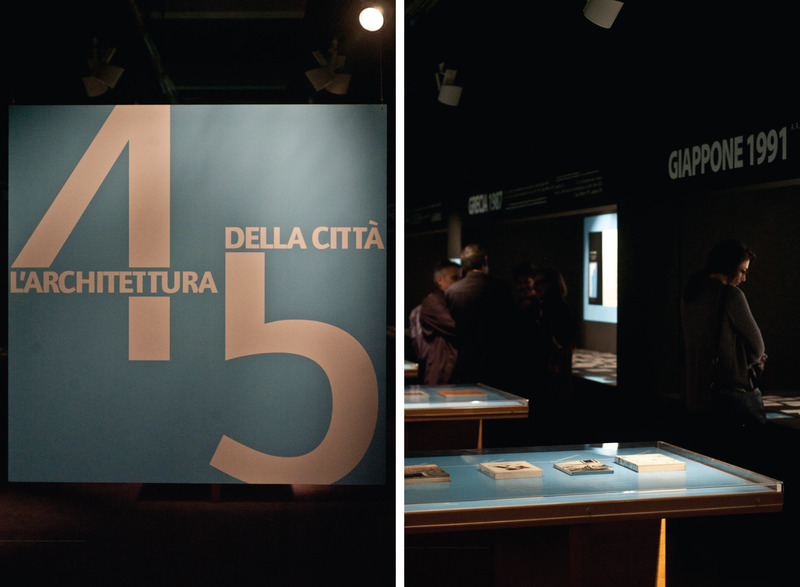 The individual writings for Casabella were thus the route towards The Architecture of the City. The book, then is a collage. Diego Seixas Lopes considered the fragmentary nature of The Architecture of the City to be a collage-like construction. He noted that the wide range of sources from disparate fields intertwined with mentions to Milizia (Enlightenment architecture), Poete (French geography), de Saussure (linguistics) and memories of cities walked by Rossi. Showing preliminary photographs of the making of the book, it looks similar to the way Rossi makes the Blue Notebooks. Freehand writing, with sketch drawings and photocopies of “things” pasted together. Now for the exhibition. The publishing history of The Architecture of the City was presented as original books, artefacts; around which, a timeline according to Rossi’s Blue Notebooks was charted. Extracts of which were scattered as loose fragments. A little bit lost looking. The publishing history reads: Italy 1966, Spain 1971, Germany 1973, Portugal 1977, Italy 1978, France 1981, Spain 1982, USA 1982, Greece 1987, Japan 1991, China 1992 (2 of), Brazil 1995, Italy 1995, Portugal 2001, Italy 2006, and the new 2011 Italy Edition. It is interesting to note the front covers. For example, the first edition of Italy 1966 superimposes a Renaissance Ideal City over an aerial landscape; Italy 1978 shows the Mausoleum of Hadrian (later transformed into the Castel Sant’Angelo). While France 1981 the Analogical City appears five years after it was first presented, then Japan 1991 the Mausoleum again after it was used by Eisenman in the 1982 USA introduction where he juxtaposed a drawing of a labyrinth, setting up ideas about journey and transformation. The China 1992 shows the Analogical City for the second time. 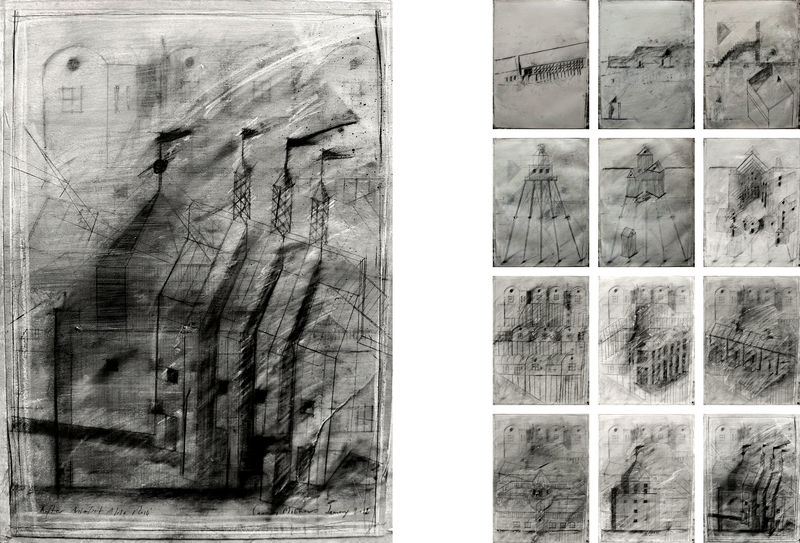 The new Edition for 2011 is from an ArtForum article titled Fragments and depicts a storyboard dated 1987 New York. And those enigmatic Blue Notebooks. Text-based notes, diagrams of objects and projects, self portrait sketch studies, fragments of train tickets, photocopies of newspapers and photographs of views are pasted within. Indeed, I took pleasure in finding out that the Notebooks measure 220mm by 175, when laid flat. These are just a few highlights in a short Blog Post. The conference was dense with knowledge, intensely focused and in true Rossian style, it was both lucid and murkily ambiguous. I am grateful for the opportunity to share such a platform and thank those who selected my proposal. Indeed, especially to Eamonn Canniffe who forwarded me the Call for Papers and Graeme Hutton for allowing me the short leave. My only criticism is that there was very little questioning of Rossi in general, and considerably less questioning directed at the speakers, in particular. Perhaps this is okay but resistance is welcome, and criticism directed at the individual research presentations should have been encouraged. Ordinary housing largely forms what we call the built environment, the city. Italian architect Aldo Rossi said that the city is built around fixed points, “monuments.” These are large collective elements surrounded by ordinary housing. In the 1966 The Architecture of the City Rossi developed a theoretical framework for the typology of buildings and their relationship to the city writing, “the study of the individual dwelling offers one of the best means of studying the city and vice versa.” The dwelling is thus both individual and collective. It refers to both itself; and analogically to the wider city, like Alberti’s analogy. This article was first published in the Brick issue of Mat.zine edited by Ryan McLoughlin. A Contextual Design and The Double? Pencil sketch plans, Street elevation and photograph of scale model”] The film maker Sergei Eisenstein proposed that with the method of montage “any two sequences, when juxtaposed, inevitably combine into another concept which arises from that juxtaposition as something qualitatively new” (Eisenstein, 1938). Montage is a visual technique that superimposes images (and/or text) or places images (and/or text) adjacently in order to produce an impression, illustrate an association of ideas, or analyse by comparison. 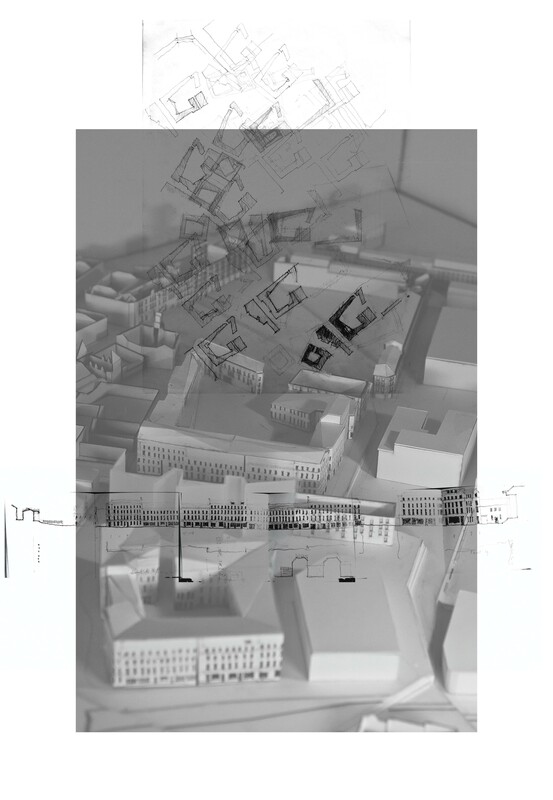 At a recent presentation on “Urban Aesthetics” in Dresden, Germany I was asked, in relation to my “contextual” design for a city centre site in Dundee, Scotland: “What do you think about “cut and paste?” Before proceeding with the reply, it is worth outlining the project. The brief proposes a building or buildings that interface with the city, the programme of which is defined by the current Local Development Plan and supplemented by the addition of an Education and Research facility. The design proposes two urban blocks to either side of an existing building. One block investigates a regular courtyard plan; the other is informed by the irregular plan of the adjacent context: the footprint of a neighbouring block is rotated, pasted to the site, re-aligned with the street and cut to fit. The elevational treatment proceeds in a similar way. The existing street elevation is drawn and the relationship of solid to void is noted. The proposition is wrapped by a series of these drawings, cut and altered as the programme necessitates. It is the “double” of the neighbouring block. My reply to the initial question: “‘Cut and paste’ is similar to the way in which film from the 1920’s uses montage. New ideas emerge through the juxtaposition of images. In urban design, a ‘modification’ takes place in-between the ‘cut’ and the ‘paste.’ The modification is something new. It is placed in a context, which is readjusted by it, to read as something new.” In the short stories of Jorge Luis Borges, The Double is our opposite. A shadow. “Analogy” is a process of reasoning that uses existing material as reference in order to construct something new. The design project shares an analogical relationship with both the context and its shadow. This article was first published in the “Cut Paste” issue of Mat.zine, edited by Stephen Mackie.